An outdoor waterproof 6 meter light chain with 60 warm white LED lights. Each of the LED lights is enveloped by a waterproof protection and features an attractive white Leaf design. 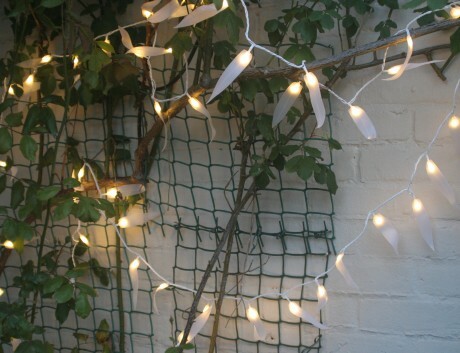 A great idea for decorating your garden party or to add festive elegance at Christmas. Note this light chain is 8meters in length of which 6meters is illuminated. How long is this outdoor light chain? Each light chain set can be connected to others to form a longer light chain. Supports up to 3 sets in tandem totalling up to 18 meters of illuminated light chain. Perfect for decorating a garden for any party, wedding or celebratory event. Can also be used indoors.